Currently Laktan Mini is the most economical and cost-effective model for the analysis of the main measuring parameters of milk in the market! It is important to know that one of the key competitive advantages of Laktan is that in all Laktan models Protein is measured directly, while in our competitors' products Protein is calculated on the basis of other measurement parameters. Laktan Mini is a portable, compact, fast operating milk analyzer with a self-contained power supply (can work with the car battery), easy-to-read display. This model is suitable for use in farms, as well as ideal for receiving milk from private farms. Laktan Mini is used to determine the percentage of fat, solids-non-fat (SNF), protein, density and added water. The average measurement time is not more than 3 minutes (180 sec) that is 2 times less as compared to the traditional analysis method. The accuracy of determining of the meas. parameters at the same time fully conforms to the requirements of the standard methods. Laktan Mini is a reasonably priced portable laboratory for milk quality control which will make your work easier and will help reduce the cost of analysis and save your time and money. Laktan Mini is supplied with the factory calibration for whole cow milk. Setting of the working mode of the analyzer takes not more than 10 minutes. The analyzer will warm up automatically after switching on. After warming is completed the message “Ready for work” appears on the analyzer’s display, after that you can enjoy the analyzer's work all day long. In this analyzer a special attention is paid to the power supply characteristics. A wide range of AC voltage from 100 to 250 V allows to work without any alterations in the villages, where there are significant fluctuations in the electricity networks. Power consumption is not more than 40W. The option of operation from the 12 V car battery allows using it effectively during milk reception from the private farms. Small size of the analyzer and its dimensions (130 x 170 x 220 mm) in combination with the small weight (only 370g) make our analyzer portable/ mobile and allow using it in field conditions. Special plastic case for carrying the milk analyzer provides safety and convenience in transportation. 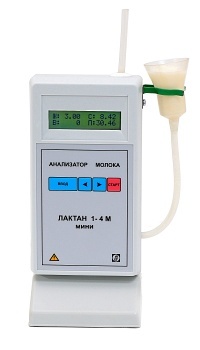 Laktan Mini ultrasonic milk quality analyzer is included in the State Register of Russian Federation for Measurement Devices under No. 46032-10, Certificate No. 42025 valid through November 10th, 2020.